This children's baseball game includes enough players for your child to field two separate teams. Baseball Guys allows your little baseball fan the opportunity to imagine, create and play their own game...no set rules or directions are included. Included in each package are 24 players, one umpire, one 28" x 28" washable felt baseball field, and a fully adjustable realistic scoreboard. 2" figures are perfect for small hands. 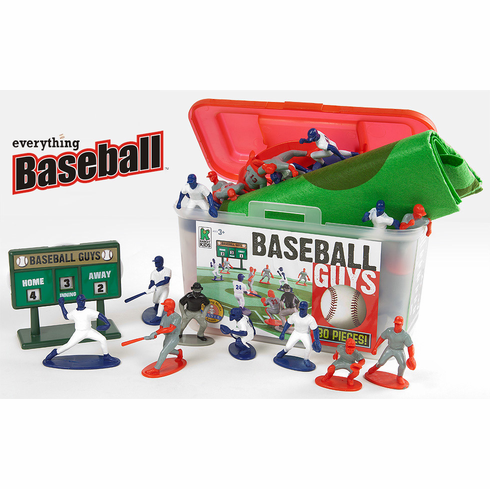 The Baseball Guys package is a clear, stackable, rectangular box with attached lid and handle. The 10" x 6" x 5" box makes it easy and convenient to bring in the car, on the plane or to a friend's house. The fun graphics and design of the container will make it the only place children will want the pieces to be when they are not actively playing with them. There will be less to clean up for Mom and Dad and fewer missing pieces for everyone. NOT INTENDED FOR CHILDREN UNDER 3 YEARS OF AGE.